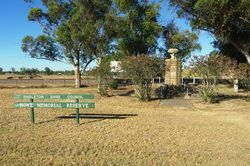 A monument commemorates the sesquicentenary of the arrival of John Howe`s exploration party in the vicinity on the 15th March, 1820. Expeditions led by William Parr in 1817, Benjamin Singleton in 1818 and John Howe in 1819 ventured north from Windsor to the land west of Singleton. The latter party was searching for new grazing land. Guided by an Aboriginal known as Myles they followed what is now known as Doyle`s Creek to its junction with a river which they briefly followed eastwards. Howe returned in 1820 to explore this river and, again guided by Myles, they continued east along the river to a site just east of present-day Singleton. It being nearly St Patrick`s Day Howe named the area St Patrick`s Plains and it subsequently became known as Patrick`s Plains. Only when they reached Wallis Plains (Maitland) did they realise the river they had been following was the Hunter. 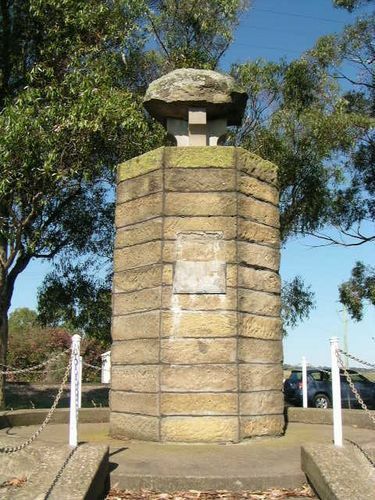 This cairn was erected to commemorate the arrival in this vicinity, on the 15th. 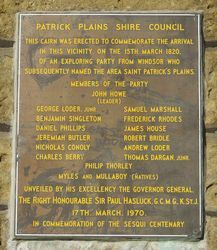 March 1820, of an exploring party from Windsor who subsequently name the area Saint Patrick`s Plains. Unveiled by His Excellency the Governor General, the Right Honourable Sir Paul Hasluck, G.C.M.G., K.St.J.